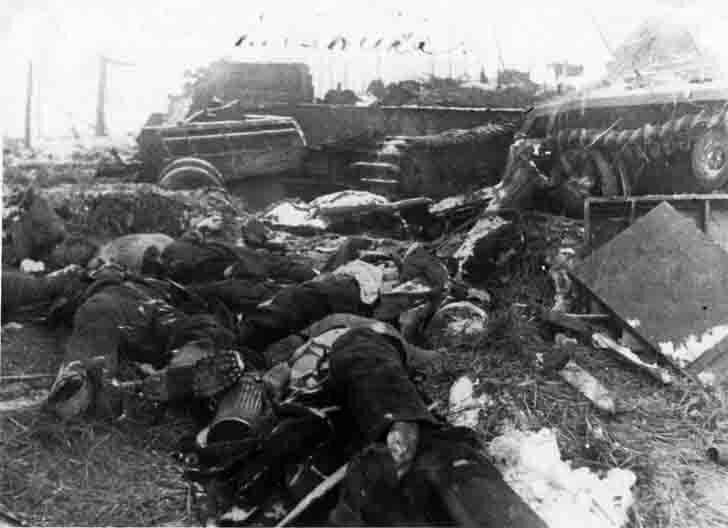 Destroyed German tanks and other armored vehicles of the Wehrmacht and the corpses of German soldiers who were killed in the village of Panskoe from the Kursk region in the fight against the 2nd Guards Infantry Division (later the 2nd Guards Motorized Infantry Taman Division). Until December 10, 1941 127 Division led heavy defensive fights northeast of Tim. Particularly strong were the village Panskoe. Wear down the enemy, the division went on the offensive with the aim of destroying it timskoy groups. Since the beginning of the Soviet counterattack near Moscow division as part of the South-Western Front, December 11 seized Nikolaevka Koshelevo, Manturovo, and then in conjunction with the 45 th and 62 th Infantry Division launched an offensive on the city of Tim. Especially persistently resisted the enemy at the village of Karandakovo. In a snowy winter with severe frosts guards cut the road, Tim – Shchigry, then began a battle for Tim. The Nazis turned it into a powerful stronghold of the defense. The most fierce resistance they provided at the turn of Sokolov Plot – Gniloe. Rapid output 127th Division on the line and break the enemy’s defenses put in a difficult position. Fearing encirclement, leaving dead and military equipment, the Nazis quickly began to leave Tim.